We @ ProSIM have expertise in Simulation, good experience in casting processes and have fair understanding of the casting materials. With this we are able to understand your problems and propose methods how casting simulation can be adopted in your company. We @ strive to solve the key technical problems faced by foundry and casting industries. We have assisted several foundries and casters to implement successfully the casting simulation in their company and reap the benefits of investment with quick return on investment. We @ ProSIM are partners with M/S Hitachi, Japan to promote their unique, state-of-the art simulation technology ADSTEFAN. We have worked with hundreds of foundries in India and abroad. To understand how casting defects such as shrinkage porosity, micro porosity, air entrapment, gas porosity, cold shut, hot tear, distortion / warpage, cold lap, misrun etc, are formed using casting simulation software ADSTEFAN. Adstefan can be used for simulation of casting of variety of materials including Ferrous alloys such as steels, cast iron, ADI, ductile iron, grey cast iron, and non-ferrous alloys such as Aluminum, copper, bronze, brass, lead, magnesium, nickel, titanium etc. Once the casting defects arising out of a particular gating design and casting process are visualised, designer will explore multiple options to overcome the casting defects by modifications to the gating system. This process of gating and process will be iterated till the optimisation of gating is achieved, without resorting to any physical pouring of metal in the plant, and by using computer simulation. 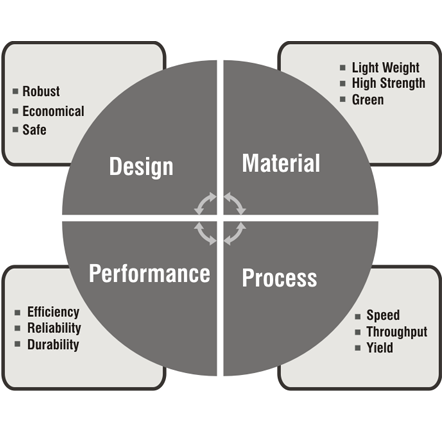 By this process of iterative evolution of gating design and process design on computer, we help metal casting companies to reduce their rejection, increase their yield. Often in India, many foundries have invested in casting simulation software, without proper returns on investment. Many have failed to utilise the same for improving their profits. At ProSIM we have assisted our customers to properly implement the casting simulation software ADSTEFAN in their enterprise.